THE RSPCA has released this disturbing photo of a cat ‘set on fire’ in a Halloween prank in Coventry. It has launched an investigation after the cat’s charred remains were discovered the next morning (November 1) in the Stoke area of the city. The animal welfare charity says the cat, named Bonnie, had been missing from her home for a week before her body was found dumped in Harefield Road. RSPCA inspector Ben Jones went to collect the body. He said: “The body was blackened and charred all over as if the cat had been set on fire. 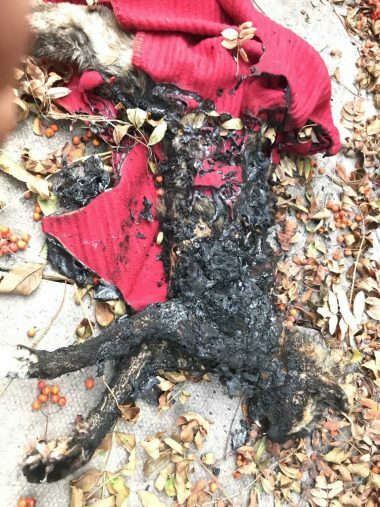 “The burned remains had then been wrapped in a charred red blanket and dumped under a tree. Inspector Jones checked the cat’s body and found a microchip registered to a nearby home. The horrified owners confirmed the animal had been missing for over a week. “I sincerely hope Bonnie wasn’t alive when she was set on fire,” inspector Jones added. “If she was alive then this is a really horrifying case. “Her body was first spotted on Halloween so my fear is that this is some sort of harrowing prank. “This has been really upsetting for Bonnie’s owners and must have been a big shock for the person who found her. Anyone with any information is urged to call 0300 123 8018. The RSPCA investigates more than 140,000 complaints of cruelty in the UK every year. Visit www.rspca.org.uk for further details.